"I wanted to know if the relationship I was in was right for me. 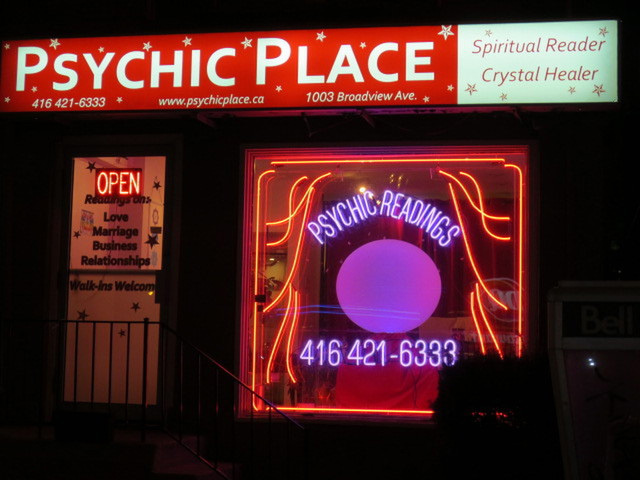 I went to Psychic Place and its the best thing I've done. I highly recommend anyone who has a problem or concern to go for the reading". "I was very unhappy in my work, I went to Psychic Place. The consultant told me she saw me in the fitness industry. I am now a personal trainer and loving every minutes of it." "I have two jobs offers, I did not know what to do, I saw a sign that Psychic Readings, so I walked in, I found the reading to be very positive and uplifting. I was told it was in my best interest to stay in Toronto. I took the advice, not only did I get the better job but found the girl of my dreams. Thank you very much." I felt stressed and constantly fatigued. I went to Psychic Place and was advised to have a chakra balancing. Thanks to them I now started painting again and socializing. I've also sold two of my paintings." "I found that I had confidence problem, opportunigy was passing me by cause I was not firm in my decision. I went to Psychic Place and purchased a Chakra power stone. I've now been appointed manager at the Best Buy."